For all of you who have wondered… Who’s Ann Lauren? What is she all about? When did she start working as a petite model for companies like Jantzen, Venus and Shelli’s Swimwear, Hawaiian Tropic, Kenar petites, Nordstrom department stores, Decleor skincare, Paul Kingsley Haircare, and dozens more? How did she go from modeling to creating and executive producing live and televised petite model shows? Why is she working to make a difference in the fashion industry for petite women? How does she plan to shape the future of BellaPetite.com?… I have good news! Ann took some time with Prospere Magazine to discuss her goals for Bella Petite and more. You can read all about it at Prospere Magazine http://prospere-magazine.com/2009/10/07/annlauren/. We wish to thank Cynthia Cheng at Prospere Magazine for the positive coverage on Bella Petite! Previous Courteney Cox Petite Star of ABC Show Cougar Town! Impressive story about you on Prospere-Magazine. 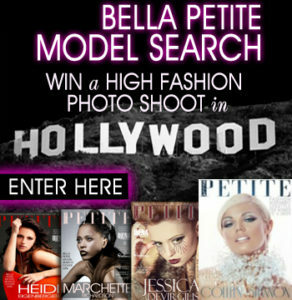 It's great there's a petite model with beauty, talent and vision leading the way for us petite gals! You are so beautiful! If there were more Petite models like you we'd have Super Models for sure! I can't wait to see your fashion magazine. Thank you for your positive thoughts! You can rest assured I am committed to creating a fashion forward brand petite women can be proud of. Every petite lady coming to our site don't forget to leave us your information joining our fashion movement, we need your support! I found and follow you on twitter! You seem to understand what us petite girls want. You are so pretty and smart you make short girls look good. I like modeling. I wish your site had more opportunities for us to get involved as models and to find clothes. The magazine will be great if you do that. I read your story on prosperemagazine and was surprised that you have done so much work and stuff. You are so great for petite women and are problems I hope you fix. Thanks for giving us this great site. Thank you for the great feedback and compliments! I truly am passionate about the petite fashion movement and all about creating the paradigm shift in the industry we petites want! Join us become a member and we will deliver!